Crafting items by hand is one of the oldest and most revered traditions we know. Crocheting is one of these traditions and a way we have of passing down our knowledge is by making patterns. This pattern is for a Starburst Afghan and is from a very old handwritten pattern, one of many that will be featured in the ‘Vintage Crochet Pattern Series’ over the next few weeks. It’s been changed a bit from the original, mainly being turned into a throw size afghan rather than a Queen sized one and changes in the pattern’s phrasing, but in essence is still the same. Using two or three colors in corresponding rows of two creates the starburst effect. Rows 6-60: repeat rows 2-5 alternating Colors A, B and C ending in a full row of Color A, don’t finish off, continue with border. Border: with Color A work on the three remaining sides of the afghan both sides and the bottom with 9 dc in the middle of the starbursts and 1 sc between them. Modernizing this pattern was challenging, but very rewarding. Do you have any questions or comments, please don’t hesitate to comment here! 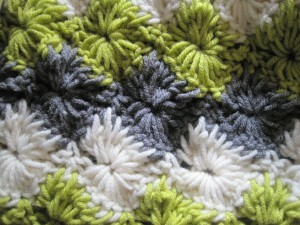 This entry was posted on Thursday, July 29th, 2010 at 1:33 AM by Erin Burger	and is filed under Free Crochet Patterns. You can follow any responses to this entry through the RSS 2.0 feed. You can leave a response, or trackback from your own site. I love this! I was looking for something sweet for an upcoming new niece/nephew! Now, she’s gotta find out which version it will be! Very pretty…I don’t know if I’m skilled enough to try it yet though. Angie! You won’t know till you try! You might just surprise yourself. If you get caught or need help ask me on here, I’ll do what I can to help you through it. Do you have a photo of what the rug looks like from further away? It looks fabulous in the close up, but as I haven’t seen this type of pattern before, I am wondering what the whole rug / effect looks like. Kind regards. I love this. Do you know what sort of yarn is used in the afghan in the picture? Your right Erin, I will put it on my to do list. Thanks! The pictured afghan was made for a customer who was allergic to wool, so I had to use acrylic yarn. It’s the Vanna’s Choice from Lion Brand. Chain 130, sc in 2nd ch from hook, *skip 3 ch, 9 dc in next chain, skip 3 ch, sc in next ch. Repeat from * across. Thanks for the info. I can’t believe I missed the sc in 2nd ch from hook. I will change it right away! Hi Sally: I don’ t have another photo because I already shipped the blanket out to a customer. It might help you to know that the pattern is for a blanket and not for a rug. ‘Throw’ referring to a smaller ‘lap-sized’ afghan. I assume I need to yo and pull through all 10 loops on the hook is that correct? If it is, is it supposed to be creating this bubble like effect? The picture doesn’t look like that, so I must not have this figured out correctly. Also when you are doing the above steps 9 times are you skipping the single crochets? Did an afghan in this pattern years ago, but didn’t care for it after it was completed as it had a tendency to really stretch apart and looked awful. Maybe it was the type of yarn or hook size you used that made it stretch so much? Probably the yarn, but this was 30 – 40 years ago, so I don’t remember much except for the fact that it stretched apart. I’m a beginner with crochet, but I think I’m going to try this! I even love the colors you have pictured, might do those. One question though – does this throw need to be “blocked” once it’s done? Such a beginner, I’ve never had to do that and not sure when it’s needed or not. I don’t have a blocking mat though. Thanks for the pattern – I’m looking forward to giving it a try! I made this afghan for a client and didn’t block it. I did however, pull apart all the starbursts because during the crocheting some of them got bunched up. How many more should I chain at the beginning to make this queen size? I love this pattern and would love to make one for our bedroom. Thank You so much! I am upset too by how this is going. I was so excited and hoping this would come out well. Instead of starbursts with nice stitch definition and everything, something I have been capable of in the past with non starbursts, I have Connie’s problem, although I would call them chunky bubbly shells. No clue here Erin so please assist. Is this what happened when you said they bunched up? I suppose you could call the two separate parts of the starbursts ‘chunky bubbly shells’. Then when the two rows with the same color are finished, the starburst is created. I just made this blanket for another client, this time in superwash merino wool and I had much better stitch definition. Thank you Erin! I am so glad to know that I wasn’t tanking for some unknown reason! Wootles! Will continue! Bernarda gets her Christmas after all! I had the same question as Connie I was also getting little bubbles I’m not exactly sure how i’m supposed to continue after I YO and pull through 2 loops 9x’s. Row four states that the repeat starts from *1 sc in dc, ch 3, and so on. However, there is another sc in the same sequence, and crocheting the entire repeat as it is written throws the entire stitch count off, ending the row with far more sc than the pattern states there should be. I’m assuming that the aterisk was just placed in the wrong spot and should have gone before the first ch 3, but if I’m wrong, please tell me why. For the (yo pull up loop in next dc, yo and pull through two loops on hook) x times, I would suggest that the dc be replaced with st, as double crocheted stitches aren’t the only stitches that one is pulling loops from; there’s the single crochet in the middle of the nine repeats of the instruction, for example. Such a change might reduce confustion, but this is just a suggestion, though. yeah something is definitely wrong with row 2! when doing the (yo pull through 2 loops on hook 9x’x) it looks like a cluster stitch! Am I missing something here? I’ve been making amiguri for a while now and thought of starting something a bit more challeging but this keeps curling up and it looks nothing like in the picture. I also seem to have a short blanket… How long is the chain of 130 supposed to be? It’s a pitty I really liked this pattern! Gave it an other try and its looking better, still got bigger openings than you do though and I don’t really understand what you mean by the border, is the 9dc’s supposed to go on all 4 sides? Cause you don’t really have middles of starbusts on the two vertical sides… I would just sc those all the way or won’t that look good? Hi, I want to try and make the Starburst Afghan for my sister. I have already bought the yarn but she want it to measure different the pattern. how do I change it? she wants a 57″ x 79″ how many to I cast on for that length? Hi Alena, it looks like the pattern uses a multiple of 8 chains in the repeat, then adds 2 more chains. So you can make a chain as long as you want your blanket to be (57″) as long as the chain is a multiple of 8. Then add 2 more chains. Thank you Rachel. My sister will be so happy and I can hardly wait to get started.